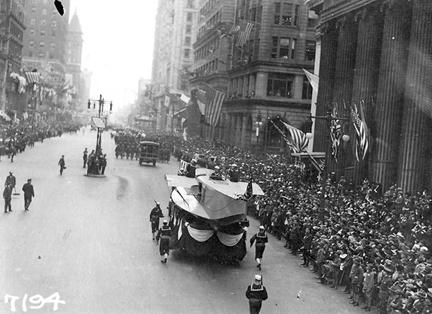 Philadelphia’s Liberty Loan parade on Sept. 28, 1918 triggered one of the worst outbreaks of flu in the country. Besides the 100th anniversary of the end of World War I, 2018 marks the centennial of one of the deadliest scourges in history, the 1918 influenza pandemic. Striking in three waves, the outbreak finally subsided in summer 1919, leaving tens of millions dead worldwide and about 675,000 in the United States. Lacking the means to diagnose flu viruses or any drugs to combat them, the medical community was overwhelmed. But the scale of the pandemic seemed to do little to dampen the enthusiasm of George Hays, then working for the U.S. Public Health Service. Writing in February 1919 to his stepmother Georgia (Carley) Hays, a native of Scott County, Kentucky, George gave her an account of his experiences among the sick at Philadelphia General Hospital that was both upbeat and curiously matter-of-fact. George Hays’s letter is part of the Manuscripts & Folklife Archives of WKU’s Department of Library Special Collections. Click here for a finding aid. For other collections about the influenza pandemic, search TopSCHOLAR and KenCat.